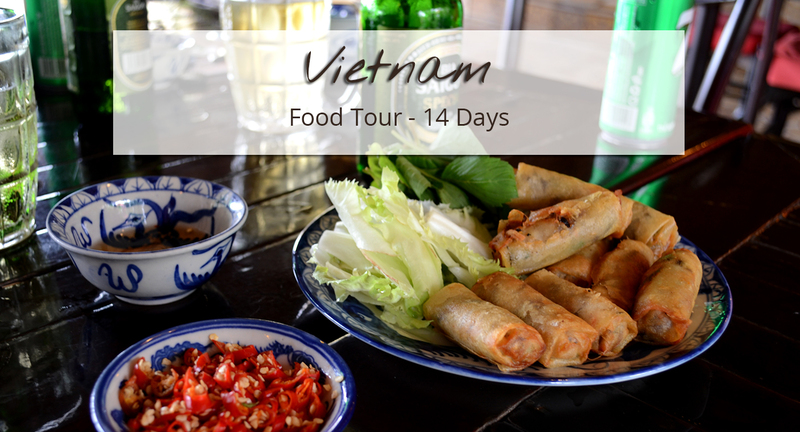 Designed to show you the diversity of Vietnamese cuisine while bringing you to the most beautiful sites of Vietnam, this tour will make you travel through the whole country. You will begin your journey in Saigon, a metropolis that offers a wide range of local dishes but where can be find also many specialties from other regions (and even other countries!). 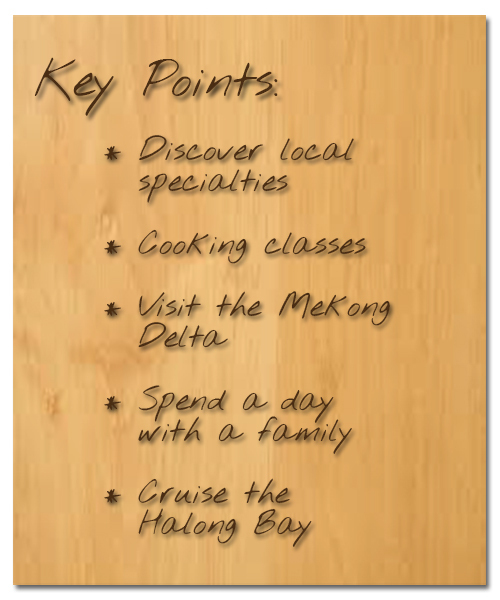 You will then spend three days in the Mekong Delta where you will get to meet people and discover local daily life. You will head to Hoi An, in central Vietnam. The city used to be a main harbor and offers some great pieces of architecture and delicious foods. Very close stands Hue, the former capital city of Nguyen emperors. Today, it is known for being the capital of Vietnamese cuisine! 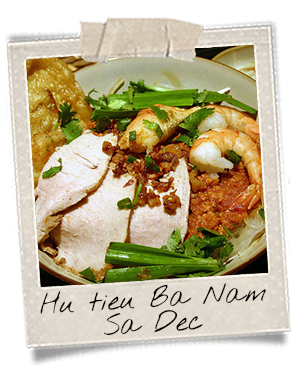 You will then go up north: Hanoi, Ninh Binh, Halong and their typical dishes. You will try soups, springrolls, goat meat, seafood of course and many different kinds of fish. You will land in the southern metropolis, Ho Chi Minh City, formerly known as Saigon. Today, it stretches over 2 000 sq. kilometers and features many places to visit from colonial quarters to working-class districts to countryside-like pieces of land. In the morning, you will tour the Chinese neighborhood called Cholon in district 5. You will wind in small streets and admire local architecture. You will visit the famous Thien Hau Pagoda and the Museum of Traditional Vietnamese Medicine. 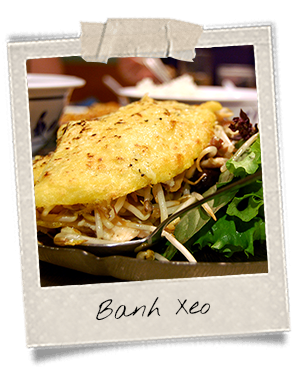 At lunch, try some Saigonese food, banh xeo. It’s a yellow pancake made of rice flour and curcuma, stuffed with soy sprouts, shrimps and sliced pork. A must-eat of southern cuisine! In the afternoon, explore the city-center and the main attractions. The Notre-Dame Cathedral, the Post Office whose roof was designed by French engineer Gustave Eiffel, the Independence Palace and its large garden, the Opera House on Dong Khoi Street (formerly known as Catinat Street during the French period): most of them display colonial architecture. Dinner at the Buffet Gánh Restaurant in Palace Hotel. Overnight at the hotel. You will spend that day discovering the other side of Saigon. 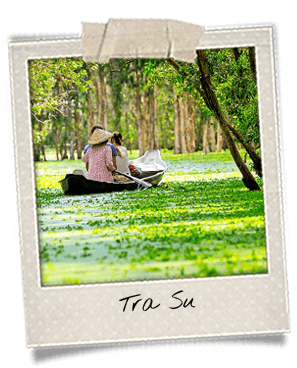 Indeed, only 20 minutes from the city-center lies a piece of countryside that resembles the Mekong Delta a lot. With your guide and your bicycle, you will tour that green gem where life passes by in a tranquil atmosphere. You will ride by the river, along paddy and lotus fields. 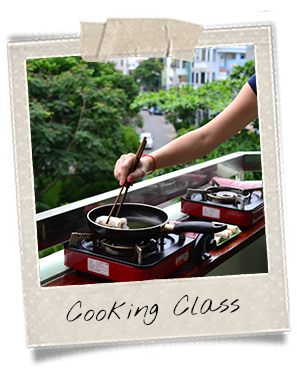 You will attend a cooking class in a typically Vietnamese restaurant and then be allowed to eat what you’ve prepared for lunch! On the menu: fresh springrolls (goi cuon), tamarind fish soup (canh chua) and caramelized pork (thit kho to). Free time as you will. Dinner in the city-center (not included). Overnight at the hotel. In the afternoon, continue the tour on the boat. You will be headed to a homestay in Vinh Long and visit a fruit garden, a very typical feature of the Mekong Delta region. Try the fruits, they are delicious! You will be given a bicycle to then take a ride around. Finally, you will attend a short music show and attend a cooking class at the end of the afternoon. Journey length: 2 hours from Saigon to Cai Be. Along with fruit gardens, Vinh Long is also known for brick ovens that stand all along the Thay Cai Canal. They look like small red pyramids by the water. It is one of the local handicrafts that you will get to discover in the morning by boat. You will also cruise by floating houses that specialize in fish farming. You will have lunch in a typical Vietnamese restaurant before hitting the road to Chau Doc. In the afternoon, you will hop on a bark to cruise Tra Su flooded forest, by the Cambodian border. The park stretches over 850 hectares and it also stands as a bird sanctuary. From September to March, water covers the forest’s floor: it is the best time to tour the place. Duckweeds are then floating on the surface, scattered with lotus flowers, providing stunning landscapes. Dive into famous French writer Marguerite Duras while visiting Sa Dec, a small town of the Mekong Delta region. The place is best known for featuring the house of the Chinese Lover (L’Amant), his tomb and his wife’s. The house of the lover was ranked as national historical site by the Vietnamese government in 2010. The main building still displays a refined wooden decoration, a large ancestor altar and a delicately inlaid coffee table. You will have the opportunity to visit the lover’s house after having tried one of the most famous foods in the town, the hu tieu Ba Nam Sa Dec. That southern dish is made of pork meat with glass noodles and a tempura shrimp. The sauce contains tomato purée. It is served with a hot pork broth. After visiting the house, you will be headed to Tan Quy Dong Flower Gardens, a must-see in the Mekong Delta. You will then get a transfer to Saigon. Dinner not included. Overnight at the hotel. Journey length: 3 hours from Sadec to Saigon. You will take the plane to Danang in the morning. Danang is a coastal and central Vietnam city. It is the closest airport to connect Hoi An. 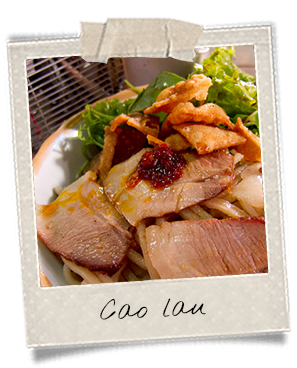 Once there, you will discover a bit of the local gastronomy with cao lau. It consists of thick noodles, braised pork, herbs and croutons. Legend has it that the noodles are boiled in water that is only coming from the Ba Le Well in Hoi An. That water is supposedly mixed to a certain type of ashes, resulting in an alkaline liquid. Cao lau’s recipe remains secret, only known to a handful of families in the city. 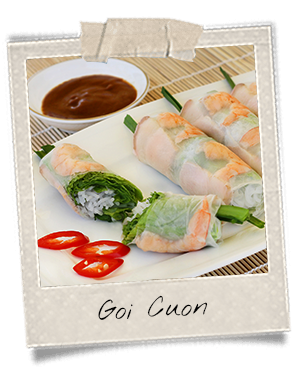 Therefore, it is a real must-try during your stay in Hoi An. In the afternoon, discover the Old Town. Take a look at the architecture. From colonial villas to Chinese houses to the gorgeous Japanese Bridge, it reflects the former activity and cultural mixture of the city when it was still a major harbor in Southeast Asia. Hoi An was then named Faifo and it used to be peopled with merchants from all around the world. In the evening, encounter a new kind of food: mi quang. That dish noodle is served with pork meat, shrimps and crackers. Delightful! 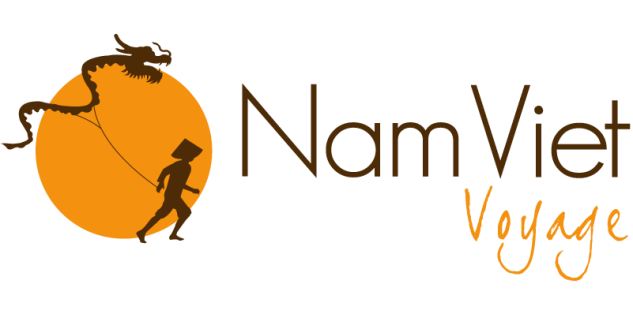 You will spend that day getting to know what Vietnamese daily life looks like. You will begin your journey at the local market where you will have the opportunity to talk to vendors. They may help you picking the right ingredients for your lunch! You will then meet a family who will show you their daily tasks. They will help you out with the prepping of food during your cooking class. Of course you may eat what you will have prepared and enjoy lunch all together. In the afternoon, cruise the Cua Dai River and admire a coconut forest. Try to fish crab in a circular bamboo boat. Careful with the balance! After getting breakfast at the hotel, you will have free time in the morning to enjoy Hoi An a little more. You may want to take a dip, then head to Cua Dai Beach. Or you might feel like buying souvenirs or stroll around the Old Town! There’s a range of options! Regarding lunch, you will be free to eat wherever you will like. Afterwards, you will get a transfer to Hue. 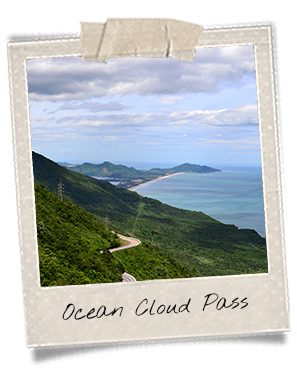 The route goes through the Hai Van Pass, also referred to as the Ocean Cloud Pass, and that offers a stunning panorama over the coast, Danang and the mountains. It’s the perfect venue to take landscape pictures. You will also stop by Lang Co Beach, a white-sanded tongue nested between two mountains, usually free of any kind of tourists. Arrival in Hue. Check-in at the hotel. Dinner not included. Overnight at the hotel. For several centuries, Hue was the capital city of the Nguyen Dynasty. It stretches on the banks of the Perfume River, along which was built the citadel. You will get to visit the site in the morning. Despite the bombings during the war, the former city features plenty of impressive buildings. It contains several ensembles that used to form the Nguyen’s residence. The Forbidden Purple City was the most private. Only members of family were allowed in. You will also visit the Celestial Lady Pagoda, Thien Mu in Vietnamese. With its 7 stories, it has become an unofficial symbol of Hue. At lunch, you will try different specialties from Hue. The city is considered as the food capital so go for it! 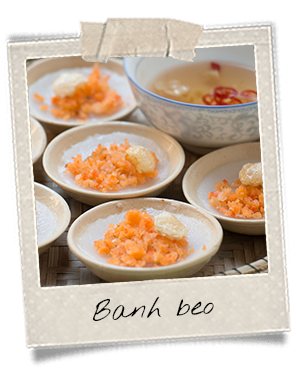 Banh beo are small cakes made of rice flour and served in small cups, topped with shrimps. Banh bot loc are small glass dumplings made of tapioca flour. They are stuffed with shrimp and pork, and usually served as appetizers. You will also try banh khoai. Those small pancakes actually look like better known banh xeo. They are smaller yet more generously stuffed. In the afternoon, you will go out of the city to visit the Tomb of Khai Dinh. It features impressive contrasts: outside the concrete shows a monochrome façade, whereas the inside of the mausoleum displays colorful glass and ceramic mosaics all over surfaces. After visiting that tomb, you will head to a incense handicraft. For dinner, get your taste buds ready for a very local dish called bun bo Hue. It is one of the most popular soups in central Vietnam. It comprises rice vermicelli noodles, beef and lemongrass. The ingredients are served in a bowl of broth. In the morning, take a stroll in the famous Dong Ba Market, the biggest of the region. Each alley displays one type of goods. You may also find there a lot of ideas for souvenirs. 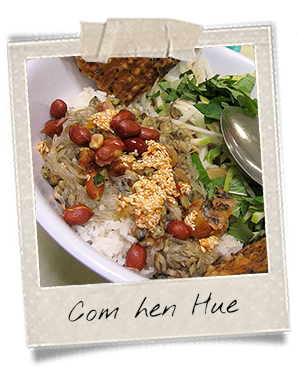 At lunch, have a taste of another specialty of Vietnamese food: com hen. It consists of a plate of rice served with baby clams, peanuts, sesame seeds and crispy noodles. That local dish may be difficult to find elsewhere since the seafood that is used in it can only be fished in Hue. Thus, this is some must-try food! You will fly to Hanoi in the afternoon. Arrival then check-in at your hotel. 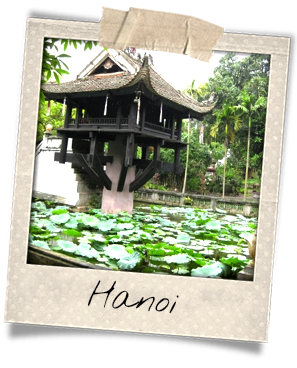 Situated in the north of the country, Hanoi is the capital city. It features many buildings listed as UNESCO World Heritage Sites, as well as street-food stalls, specialized shops and picturesque quarters. You will start touring the most famous places: the One-Pillar Pagoda, the Temple of Literature which was Vietnam’s first university, the Mausoleum of Ho Chi Minh, the leader of the nation (exterior) and the Presidential Palace (exterior). 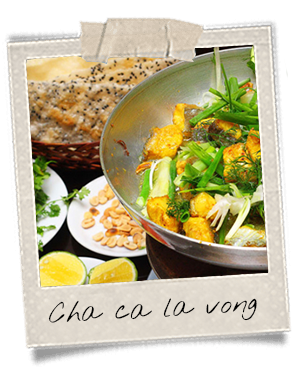 For lunch, discover a Hanoi’s cuisine specialty: cha ca la vong. 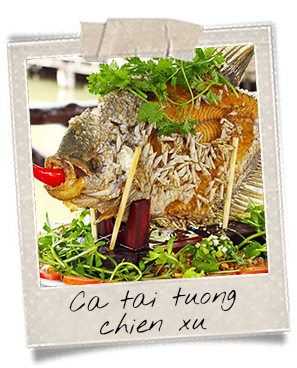 It is made of fried fish, served with rice vermicelli, fresh herbs, roasted peanuts and shrimp paste or fish sauce. In the afternoon, enjoy Hanoi’s Old Quarter: walk around the Hoan Kiem Lake, whose name means “Lake of the Returned Sword” and wind in the small streets of the 36 Corporations. Immerge yourself in the atmosphere of the city. You will head to Ninh Binh in the morning, the so-called “Halong Bay on Land.” It is dubbed as such because it features the same kind of sugarloaf-shaped mountains as in the true Halong Bay. The only difference lies in the fact that those rocks don’t come out of the water but of the ground. At their feet wind rivers that visitors may cruise. In the morning, you will visit Hoa Lu, a city that was Vietnam’s capital three times in the past. It comprises the biggest pagoda in Vietnam called Bai Dinh, and the well-known Le and Dinh Temples. Inspired by Chinese architecture, those buildings remain in good condition. Hopefully, that tour will have whetted your appetite and you will feel hungry for lunch. Some very local food will be served: grilled goat meat. 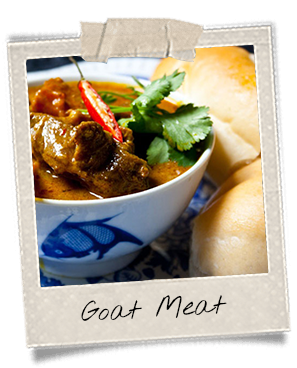 Because of its natural environment ideal for goat farming, Ninh Binh region produces the best goat meat in the whole country. In the afternoon, you will admire the gorgeous landscapes of the Halong Bay on Land on bark then on bicyle. Journey length: 2 hours from Hanoi to Ninh Binh. 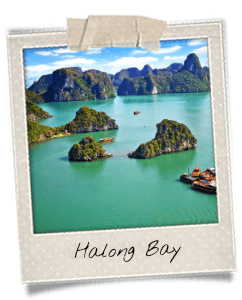 In the morning, you will go to the Halong Bay, a UNESCO World Heritage Site. The bay is also listed as one of the New 7 Wonders of Nature. And indeed, the place is globally known for its beautiful sugarloaf-shaped rocks emerging from the turquoise water. In Vietnamese, its name means “descending dragon.” Legend has it that the color of the sea in the bay comes from the skin of the dragon lying in the depths. You will embark on a cruise at the heart of the Halong Bay. You will explore caves, swing by floating villages. Lunch will be served on board and will be made of fresh seafood, a local specialty! You may also have the opportunity to take a dip in the water and kayaking through that amazing location. Dinner on board. Option to squid fishing. Overnight on the boat. Journey length: 4 hours from Ninh Binh to the Halong Bay. After a light breakfast, gently wake up your body with a Tai Chi class on the deck of the boat. Tai Chi is a Chinese exercise. It consists of soft gymnastic and slow movements. You will continue cruising the bay further in the morning, before getting brunch on board. Then, it will be time to leave the bay and head to Hanoi to fly back home. Dinner at the airport not included.